On the afternoon of June 9th, Upper School students were acknowledged for a number of achievements. National Merit Scholars and Honor Society members were commended, and a number of rising seniors received college book awards sponsored by colleges and universities around the country. 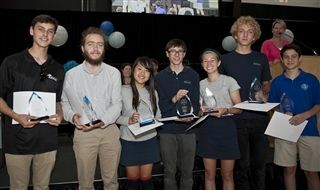 Mission awards were presented to students in grades 9 through 12, and three additional awards honored Seniors who have most embraced Harkness learning, academic integration and service to the school. Congratulations to all Pacific Ridge students for your many accomplishments this school year!